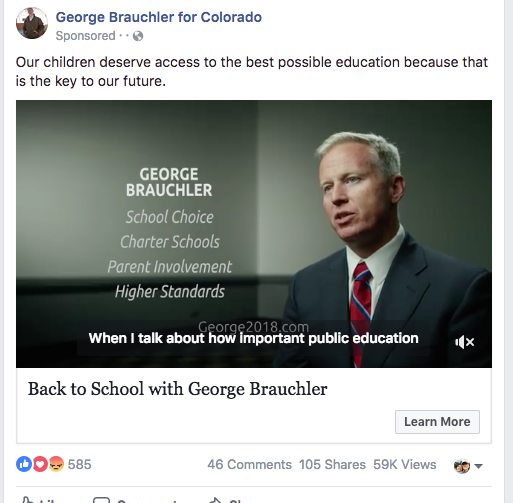 About the message: This Facebook ad promoted a video from George Brauchler's GOP gubernatorial campaign. The ad emphasized education and the candidate's support of school choice and charter schools. On Nov. 13, 2017, Brauchler abandoned the race for governor and announced he would run for attorney general, with incumbent GOP AG Cynthia Coffman running for governor. About the messenger: George Brauchler is the elected district attorney for the 18th Judicial District. He's served in the U.S. Army Reserve and is now a lieutenant colonel in the Colorado Army National Guard. He's noted for his prosecution of Aurora theater shooter James Holmes, convicted of 24 counts of first-degree murder and sentenced to live in prison without parole. Brauchler had sought the death penalty in the case.